Application form for a private hire vehicle licence and guidance on how to complete the form. All drivers of private hire vehicles are required to satisfy that they are fit and proper persons to hold such a licence. The Council is empowered in law to check with the Criminal Records Bureau (CRB) for the existence and content of any criminal record held in the name of the applicant. 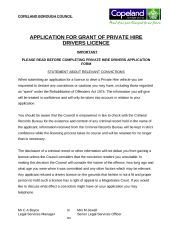 Please note that the CRB application forms are only available from the Council Offices.